To be honest it's been one of our favorite bowl game names/sponsorships over the last few years. Maybe because we always have Tostitos here in the office, with guacamole of course (we do live in Texas). Although we were heart broken when the Fiesta Bowl cut ties with Tostitos a few years ago, we understand that all good things do come to an end. 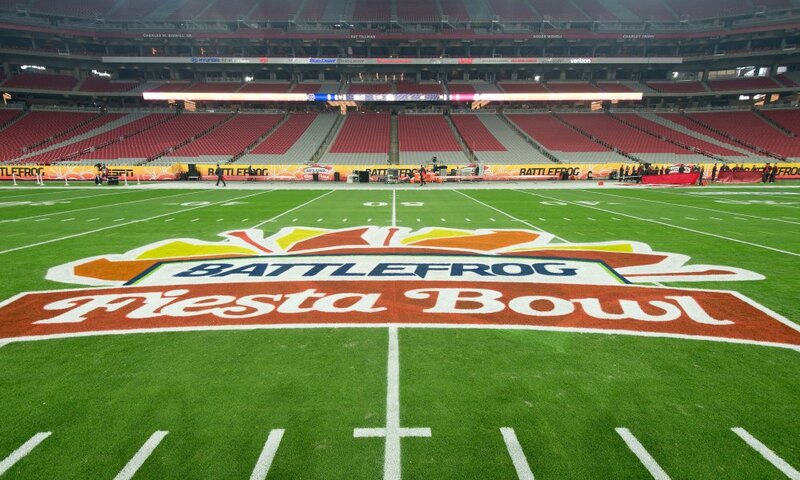 The carousel of Fiesta Bowl sponsors continues this year meaning the Battle Frog Fiesta Bowl is no more! That's right, it was the Battle Frog Fiesta Bowl last year. So, who is going to take over as the sponsor? Ladies and gentlemen, let us introduce to you the PlayStation Fiesta Bowl! It has quite the ring to it doesn't it? Ugh. “The Fiesta Bowl is pleased to partner with PlayStation to present this year’s PlayStation Fiesta Bowl,” Fiesta Bowl executive director Mike Nealy said in a statement. The Fiesta Bowl now falls under the College Football Playoff umbrella which means ESPN now manages all sponsorship negotiations. So really we have ESPN to thank for this one. “As leaders in entertainment and technology, ESPN and PlayStation share some of the most passionate fans in the world. The demographic drawn to PlayStation also consumes ESPN content, and the Fiesta Bowl is an excellent vehicle to reach those passionate college football fans,” ESPN executive Ed Erhardt said. The Fiesta Bowl is still a premier band bowl game with both bands getting plenty of time to march pregame and halftime as well as a big parade. Hopefully this means that all band members will also receive a PS4 or dare we say a PlayStation VR! Haha, who are we kidding! We'll be lucky to get a t-shirt. It will always be the Tostitos Fiesta Bowl in our hearts!